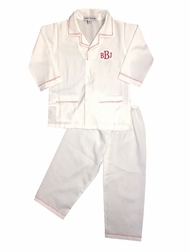 These are absolutely adorable pajamas for little boys by Sweet Dreams! 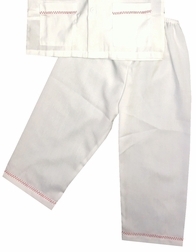 They are made in white and trimmed in red zig zag stitching on the Peter Pan style collar, sleeves, pockets and pants, perfect for Christmas eve, morning and Christmas card pictures. 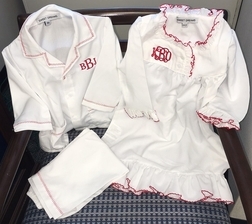 Monogram your little one's name or 3 initials in red in the font style of your choice. AND, we have the matching sister's night gown too!